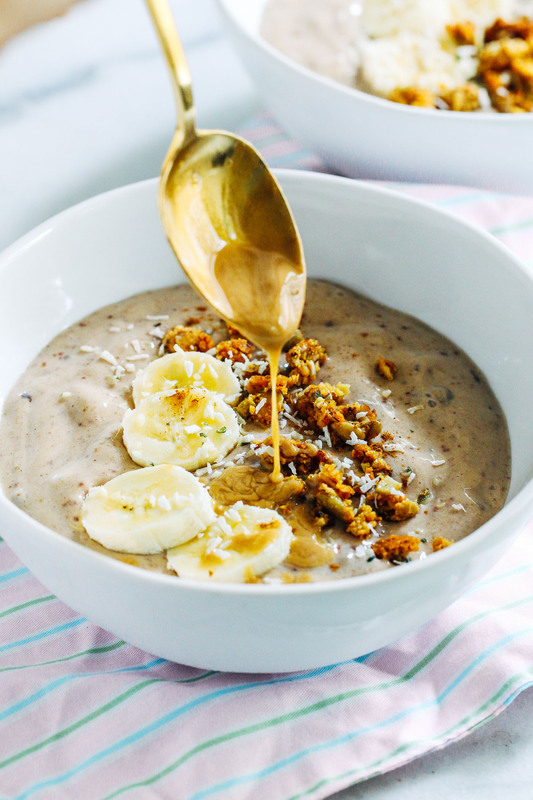 Tahini Date Smoothie Bowls- a thick and creamy smoothie bowl packed full of protein, vitamins, potassium, and magnesium! Guys…can we talk about the magic of tahini and dates? They’re seriously a match made in heaven. The sweet caramel flavor of the dates paired with the nutty creaminess of the tahini. I’m a wee bit obsessed. 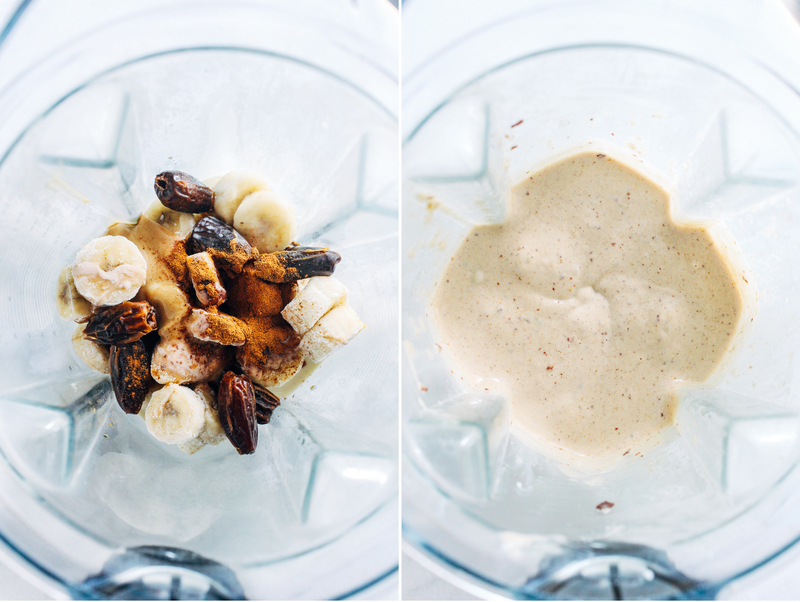 If you haven’t tried this combo in your smoothie yet then you are seriously missing out. Not only does it taste amazing but it offers nutritional benefits like protein, fiber, magnesium, potassium and iron. 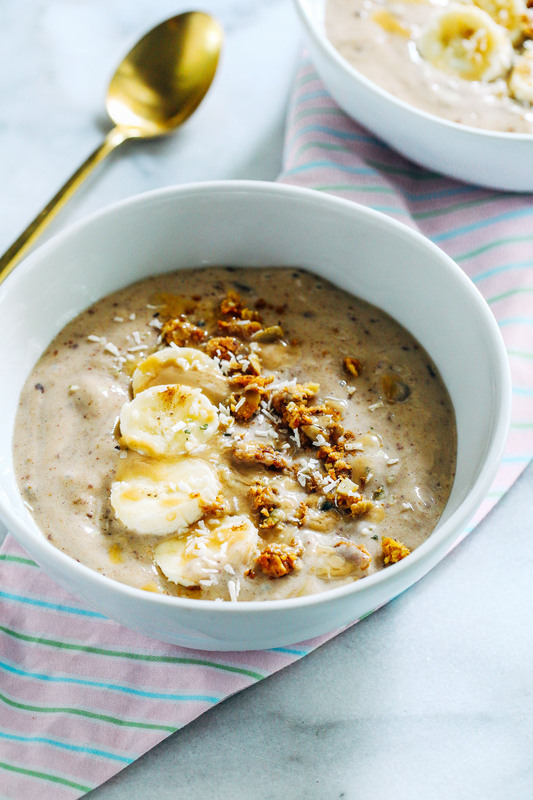 I like to blend the tahini and dates with frozen banana to make a thick and decadent smoothie bowl that’s almost reminiscent of ice cream. 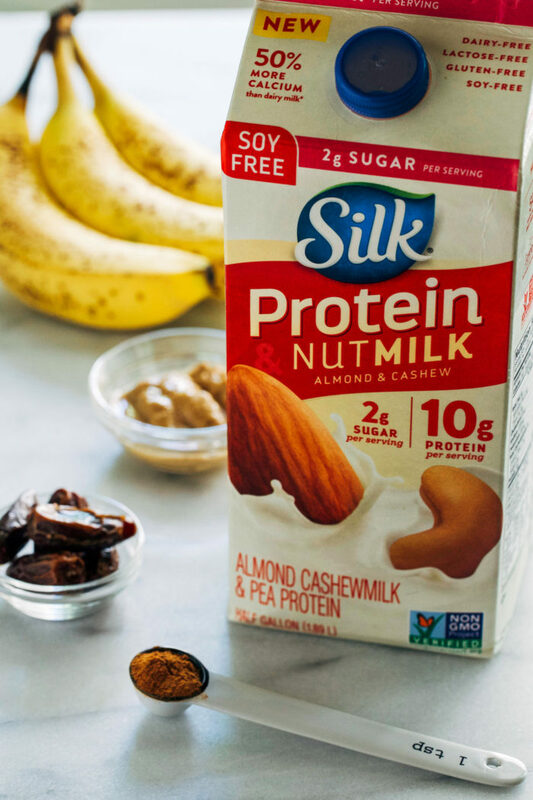 I’ve also been loving Silk’s new Protein Nutmilk in my smoothies because it has a super creamy texture and it supplies 10 grams of plant protein per cup! All thanks to a blend of almonds, cashews and pea protein. No strange, unrecognizable ingredients and it tastes delicious too. A sprinkle of cinnamon, a dash of vanilla extract and a pinch of sea salt takes the flavor of these smoothie bowls over the top. Serve them with your favorite crunchy granola, shredded coconut and a drizzle of tahini, and you’re good to go. Whether you eat them for breakfast or dessert, it’s sure to cool you off and please your taste buds in the best way possible! Place all ingredients into a blender and blend until smooth. Add more milk, as desired. Serve cold with granola, hemp seeds and a drizzle of tahini. 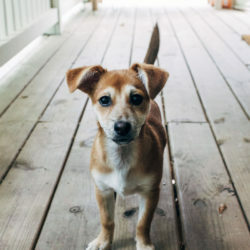 This post was created in partnership with Silk. 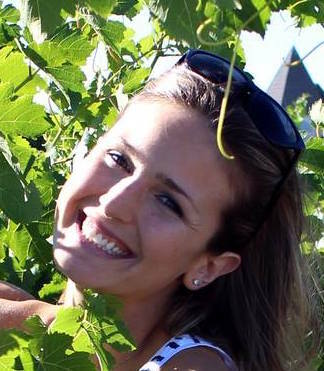 I’m proud to work with brands that care about the health of their consumers and the planet. As always, all opinions are entirely my own. Thank you for your support! It’s been a hot minute since I’ve added tahini to my smoothies–this bowl looks so good Sarah! Ok, I’ve still never tried tahini, but this makes me want to run out and buy some. 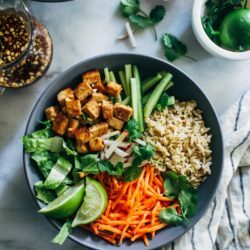 This is so simple, but it looks amazing! It’s so versatile! 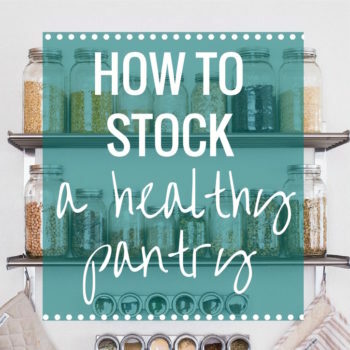 Great for salad dressing too! I love Silk’s protein nut milk! 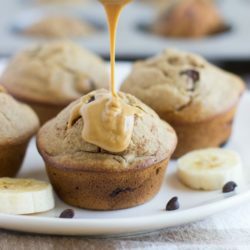 My boys need so much protein and the nut milk is such a great plant-based option. You’ve convinced me to try dates and tahini — I’m not a huge fan of dates normally but they’re growing on me. I can only imagine how great they are in smoothies, and I’m down for a smoothie that’s like ice cream! Woah! Almond and cashew? I’ve not tried it! 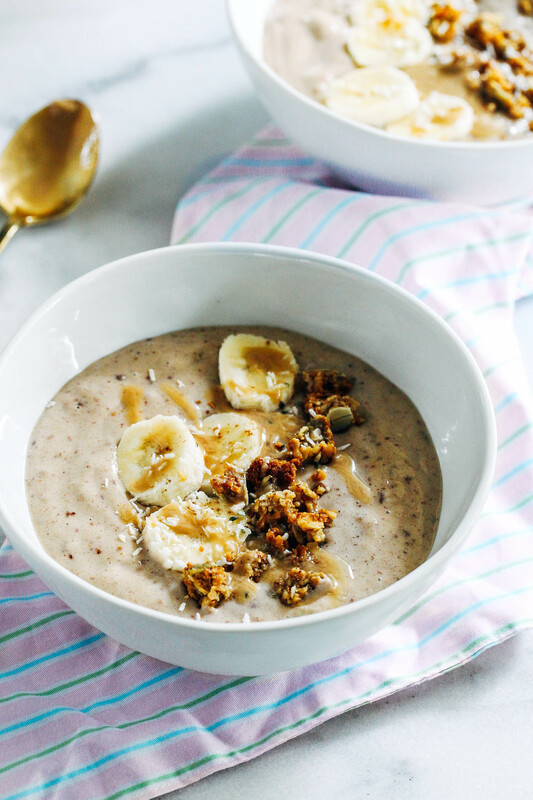 Creamy smooth I can imagine and in this smoothie bowl… a perfect combination of flavors – those dates though! 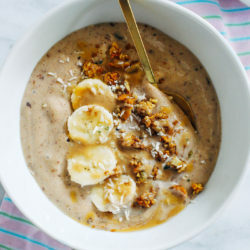 I’ve never tried tahini in a smoothie bowl, Sarah, but with the ingredients you’ve combined here, my switch is flipped! Look how thick and creamy (cue bug eyed emoji!) :p !! I know you like to make your own cashew milk but this one is great in a pinch and you can’t even taste the added pea protein. It really is delicious! This sounds so delicious! I love tahini and have never put it into my smoothies for some reason. Definitely going to try this out! Oooo this sounds so good! I’ve been using tahini in my granola lately but have yet to try it in smoothies! SUCH a great idea! Do you have any suggestion for something other than banana in here? They unfortunately give me massive stomach aches when raw… so sad. 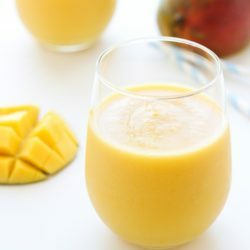 Peaches tend to be pretty neutral in smoothies … I’m wondering how they would taste in here… must try it! Thanks Ashley! You could try using frozen milk cubes and yogurt for a creamy base. Peaches might also work though! 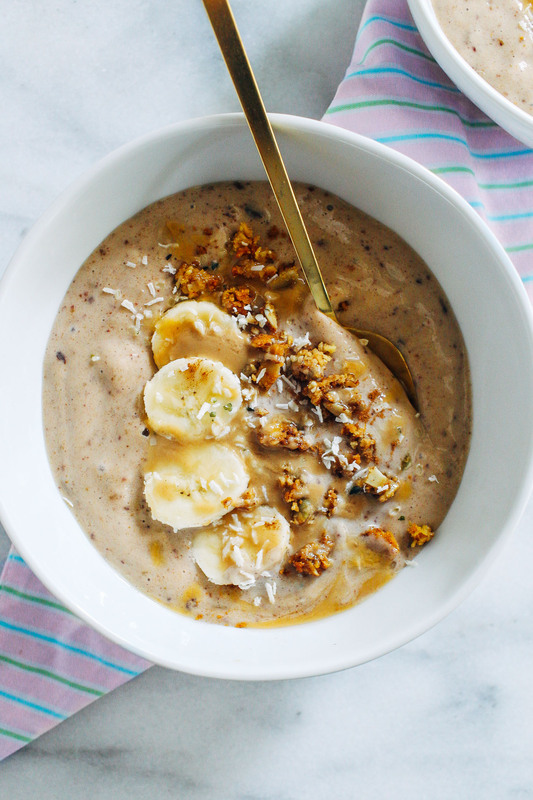 I so need to give a try to adding tahini to my smoothie bowl! Love Silk’s new protein milk and this bowl is beautiful! Thanks Kim! I love their new protein milk too! This looks so thick and creamy- got my mouth watering!! 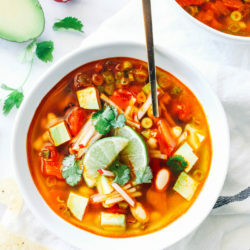 Love the fact you’ve added step by step pictures too, super useful for when I try this bowl! I’m loving the idea of tahini and dates together!! 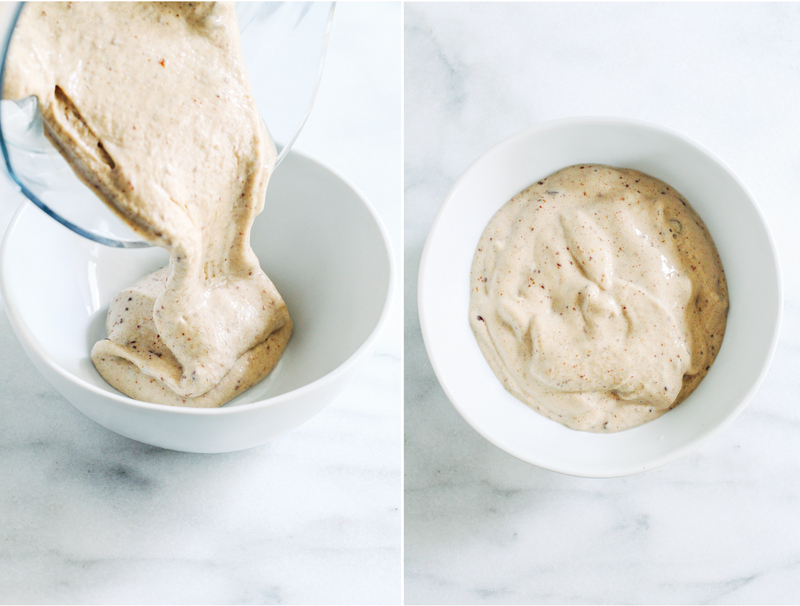 I could put tahini on everything but have never thought of putting it in a smoothie before. Such an amazing idea! I also need to check out that protein packed nut milk, so awesome! Hi Patsy- I don’t have the calories but I am working on getting a new nutritional calculator for the site. Hopefully I will have it available soon!